Guess what? I’m a wife now! Hooray! I’m not sure if I’ve totally realized it yet, but at least I’ve got to the point of thinking that it’s so much cooler to be called a wife than a girlfriend and it makes me super happy. So in short, we had our wedding and then we left for our honeymoon. Everything was wonderful. There have been so many (big!) emotions going on lately with all the preparations, the wedding and the trip, that I’m still feeling kind of overwhelmed with it all. It’s a lot to take all that love in! So while I’m waiting for things to fall back into place, let’s talk about something easy. Like this soup that I made! I think soups are one of my favorite foods around this time of the year, but somehow I don’t make them that often though. A few years back I had a habit of preparing a big vegetable soup and then freezing it in small portions for future moments when I wouldn’t have the time or energy to cook. It was a rather smart habit now when I think of it, and I hope I’ll get my soup routine started again this autumn! 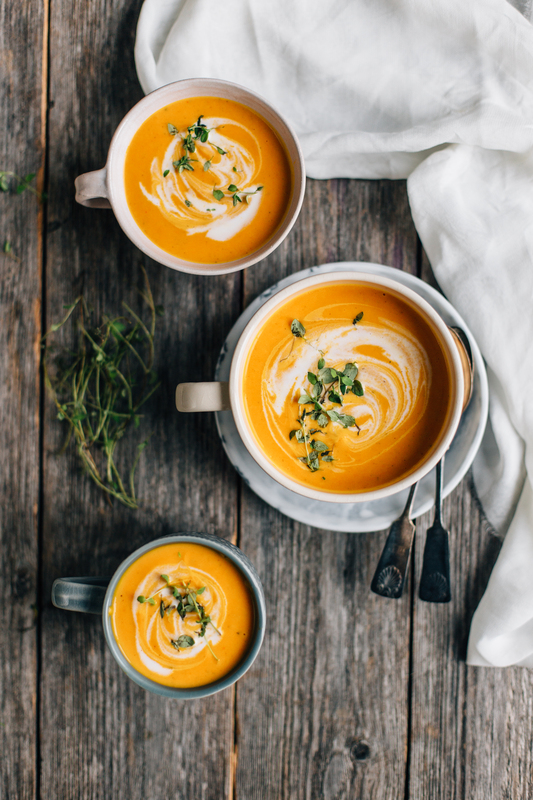 But first, let’s get to this roasted sweet potato and bell pepper soup. I made it for a client in the end of this summer and thought I’d share it here too, as it has everything I’m craving for now. It’s a simple and nourishing weeknight meal, and it just makes me feel really good. Instead of boiling the vegetables, I roasted them in the oven with some olive oil and herbs and then pureed the soup in my blender, which makes it wonderfully creamy. It’s super easy to peel the bell peppers after they’ve been roasted in the oven, which makes the soup even smoother, but this step can totally be skipped if you’re looking for a quicker route. So just follow your heart, do as you feel, and enjoy the soup as it is or with a piece of your favorite bread or cracker, like I usually do. 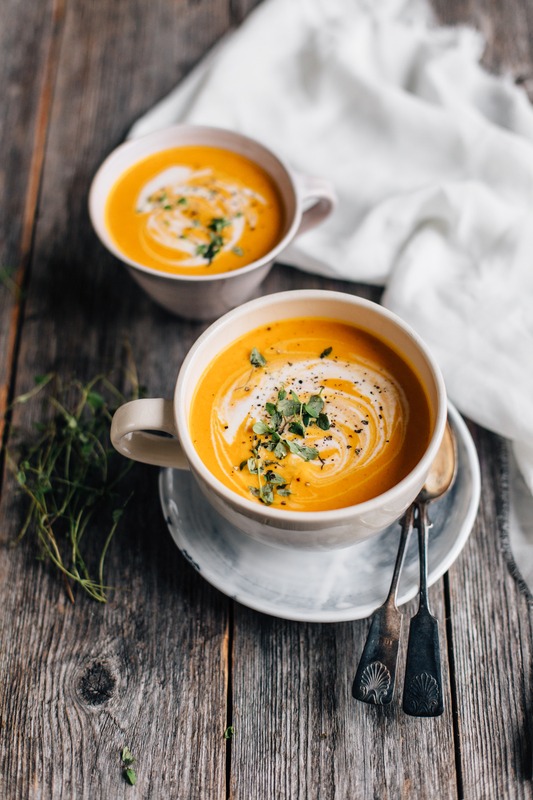 And if you’re looking for more simple vegetarian meals for these autumn days, check out two favorites from the archives below! 1. Preheat the oven to 400F / 200C degrees. Cut the peppers in half and remove the seeds and strains. Peel the sweet potato and cut into wedges. Peel the onions and garlic and cut into small pieces. Arrange the vegetables on a baking tray covered with parchment paper and drizzle the oil on top. Top with fresh thyme. Bake for about 30-35 minutes, until the vegetables are softened. 2. Take the vegetables from the oven and transfer the peppers into a box with a lid or into a plastic bag and close the lid / bag. Let rest for 10-15 minutes. This will help you to remove the skins from the peppers. 3. When the peppers are slightly cooled, peel them carefully by hand. Transfer all the vegetables into a large saucepan. Add the coconut milk, water and spices and bring to a boil. Puree the soup in a high-speed blender or with a hand blender. Taste, and add spices if desired. Serve warm and enjoy! Tagged autumn, grain free, lunch & dinner, sweet potato, vegan, vegetables, vegetarian. These naturally sweetened healthy breakfast cookies are a perfect snack and they're loaded with feel-good energy. Mmm this soup looks so creamy! And that swirl is the bomb! <3 I also really love to roast the veggies or root before puree them into soup. It makes the whole difference! Sweet potato is a favorite, but I never tried it with bell peppers. Thanks for the tip! And HUGE CONGRATS to the wedding and being a wife and all!! <3 I also really look forward to call myself a wife, and to have a wife ;-) A seemingly small but probably major shift. Where did you go for your honeymoon? I remember seeing some sunny pictures on instagram but now I can't recall where it was. Greece..? Anyway! Hope you are having a cosy week. Hi Tuulia. I am looking forward to making the Roasted sweet potato and bell pepper soup. Please kindly advise if I should use green bell peppers. Thank you.